This episode has a lot of great things to offer — both comedically and dramatically. But, unfortunately, these things do not belong in the same episode. While the series in its early days could balance multiple genres in a single installment with great mastery, the growing wackiness of the lighthearted moments coupled with the overbearing melodrama of the darker ones makes for a contrast that I personally find too jarring when paired together in a 42-minute installment. This episode, which apparently went through Hell and back several times during Pre-Production, has probably the best Xena/Gabrielle relationship stuff from the entire season, as the duo considers splitting up while the latter stays on to rule over the misguided Amazons. This leads to a wonderful moment where Xena FINALLY sits down and reads Gabrielle’s scrolls. It’s amazingly satisfying. Meanwhile, this episode gives its audience some wonderfully silly comedy as Joxer is found peeping on bathing Amazons, and later is caught making out with one in a hut. The WWE match between Xena and Joxer is an undesirable farce. It’s all very enjoyable, but again, does it belong in this episode, which, at its heart, looks to explore the current dynamics between Xena and Gabrielle? Perhaps you may feel that it does, but for this viewer, “Kindred Spirits” is too disjointed. Here is an on-set report of the production of “Kindred Spirits” from Titan: The Official XENA Magazine, Issue #8. I featured this episode as #15 on my list of the 60 best episodes. Read my thoughts here. Here are scans of an interview that writer Carl Ellsworth gave on “Antony & Cleopatra” for The Chakram Newsletter: #13. 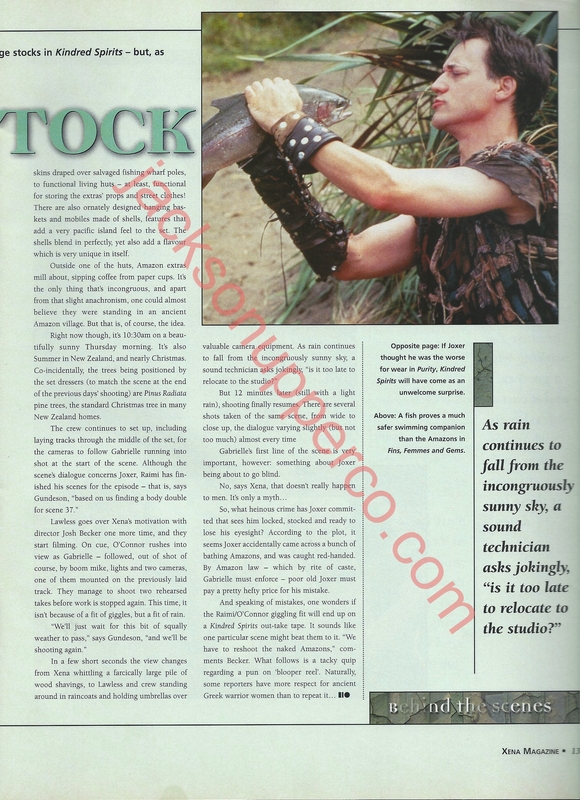 Here is an on-set report of the production of “Antony & Cleopatra” from Titan: The Official XENA Magazine, Issue #9.